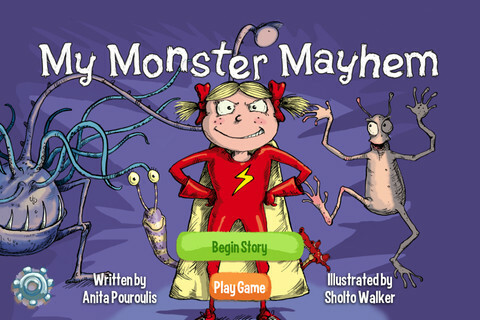 FREE for a limited time – My Monster Mayhem, an interactive e-book for the iPhone/iPad which normally sells for $4.99. It is the story of a little girl and all of the monsters in her house (imagination) that prevent her from doing what her mother asks her to do – turn off lights, not waste dental floss, etc. What her mother doesn’t seem to understand is that she is really a hero! The storyline is cute and there are animations/interactivity found on almost every page – kids pop bubbles from the bathtub, play tug of war with the Broncus Dentus, etc. Kids also collect hidden monsters on almost every page to unlock puzzles at the end of the story. The “existence” of the monsters is left open for discussion/interpretation – perfect for kids that are a bit older. Thanks for another great story, Digital Leaf!